CREATe organized two events on Friday 20th January 2017 to launch the Digitising the Edwin Morgan Scrapbooks Project: a free training event about digitising photographs and the launch of the web resource. The collection of Edwin Morgan Scrapbooks – a unique and culturally significant mixed-media collection of artistic work from the early to mid-twentieth century – is one of the case studies selected by EnDOW researchers Kris Erickson and Victoria Stobo will carry out right clearance simulations. The third progress meeting of EnDOW was organized by CREATe at the University of Glasgow, on 19-20 January 2017. The agenda covered, among other things, the consolidation of the analysis of diligent search in 20 countries and the final draft of the flowcharts of operations for the EnDOW digital platform, which will be in operation in the next months and will be officially presented in June. On the 30th of June 2016, the EnDOW workshop on the diligent search requirement and crowd-sourcing took place at the Institute for Information Law (IViR) in Amsterdam. The working group was composed by the project participants, the members of the advisory board and experts and practitioners of the relevant sector. Overall, 30 participants took part to the workshop. Three main presentations opened a very useful and enriching discussion focused on the diligent search requirement and the process of crowd-sourcing. Firstly, Maurizio Borghi briefly summarized how a diligent search must be carried out, stressing the requirements provided by the European Directive on orphan works, their ambiguities and possible interpretation. Then, Maarten Zeistra focused on the crowdsourcing, trying to figure out how to made this mechanism effective and efficient and providing the group with examples in this sense. The third presentation has been made by Gyta Berasniviciute of EUIPO which provided the group with an overview on the implementation of the Orphan Works Database, its interface and mode of operation. The working group also made a search simulation through the database. “Food for thought” has been shared by the group and the project participants had the opportunity to listen to the opinion of experts and workers in the sector of libraries and archives. The workshop focused on the orphan works legislation, addressing the main hurdles that cultural institution have to face when carrying out a diligent search of rightholders. The workshop was carried out in an interactive way, by engaging the public in practical “diligent search exercises”, the outcomes of which was subject to panel discussion. Maurizio Borghi, Aura Bertoni and Marcella Favale presented the EnDOW project and the survey of the sources for diligent search in UK, Netherlands and Italy (download the presentation here). C. 1980 the Scottish Film Council (as it was then) donated the 35mm nitrate film print to the BFI National Archive (then National Film and Television Archive)’s Galashiels Collection. Details in the SFC donor file. Sue Bell in Communications and Marketing at the Scottish Borders Council passed my enquiry on to their Museums and Archives Service in case they have any surviving records. They furthermore suggested contacting the film’s sponsor, Pavilion Theatre, Galashiels, which was already underway. A voicemail was left for Fiona Colton, Senior Curator at the Scottish Borders Council Museums and Archives Service and her colleague Paige Hughes located original acquisition paperwork from their archives that revealed the original master 35mm nitrate film, which was donated to Lauderdale and Ettrick Council (now part of Scottish Borders Council) in 1978 and was copied to safety film at Brent Laboratories for the Scottish Film Council, was donated by one Jim Smith of the Old Gala Club, Galashiels. The safety copies were purchased by the Scottish Screen Archive via the Scottish Film Council and the 35mm nitrate original was apparently donated to the National Film and Television Archive (now BFI National Archive) in 1979/80. Pavilion Theatre’s present day manager was very helpful but pointed out that the Pavilion Theatre now is on different premises in Galashiels and is no longer the same entity as it was in 1951. They have no record related to the film and assert they are not in a position to sign any paperwork. It may be possible to trace a surviving relative of Jim Smith (assuming he is no longer alive, which seems credible 64 years later), however, this would require more time than was available prior to publication, so research would need to be carried out after making the film available if the risk to do so is accepted and approved. A total of over 350 different sources have been identified in Italy; over 200 in the UK and almost 90 in the Netherlands. A Diligent Search on published books may require consulting up to 32 different databases in the Netherlands, up to 80 in the UK, and up to 131 in Italy. Of all the sources to be consulted to conduct a Diligent Search, 70% are freely accessible online in the UK, 56% in Italy and 54% in the Netherlands. This means that, depending on the country, from one third to almost a half of the required sources are not available for free (unrestricted) online access. The online availability of sources is the highest for published books (75% in the UK) and the lowest for audiovisual works (only 42% in the Netherlands). Guidelines on how to conduct a Diligent Search have been issued only in the UK (by the Intellectual Property Office); no guidance has been provided in Italy and in the Netherlands. The study suggests a possible solution to this problem that involves soft-law intervention to establish hierarchies among sources for Diligent Search, with a diversification between compulsory and optional sources, depending on their relevance and accessibility. Moreover, the study suggests that a Diligent Search should be considered to be carried out in good faith also when sources that are not freely accessible online are disregarded. The Report on “Requirements for Diligent Search in the United Kingdom, the Netherlands, and Italy” is available for downloading from the Resources page. On the 19th and 20th of January 2016, at the Università Bocconi in Milan, the first Progress Meeting of the EnDOW Project took place. All project participants were present. See the Agenda of the meeting here. A number of presentations illustrated the status of the various work packages. Kris Eriksson reported on the progress of the Work Package N. 3 and explained the plans for the forthcoming round of interviews to representatives of cultural heritage institutions (here). Overall, a very productive meeting, whose minutes are available here. The first outcomes of EnDOW project were presented and discussed at the 4th Europeana Licensing workshop in Luxembourg on the 26th and 27th November 2015. 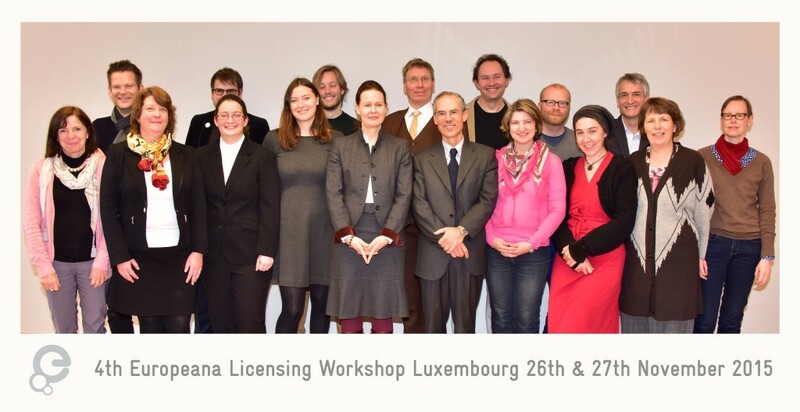 The workshop was organised by the Bibliothèque Nationale de Luxembourg, Kennisland (Amsterdam) and the Institute for Information Law (IViR) of the University of Amsterdam.